Holiday shopping can be stressful – but getting the perfect gift for the skiers and snowboarders on your list doesn’t require busting doors, battling crowds of fellow shoppers or waiting in long lines at the checkout. We’ve compiled this handy guide to holiday shopping ideas that will bring a smile to the face of everyone who enjoys Winter In Its Original State. 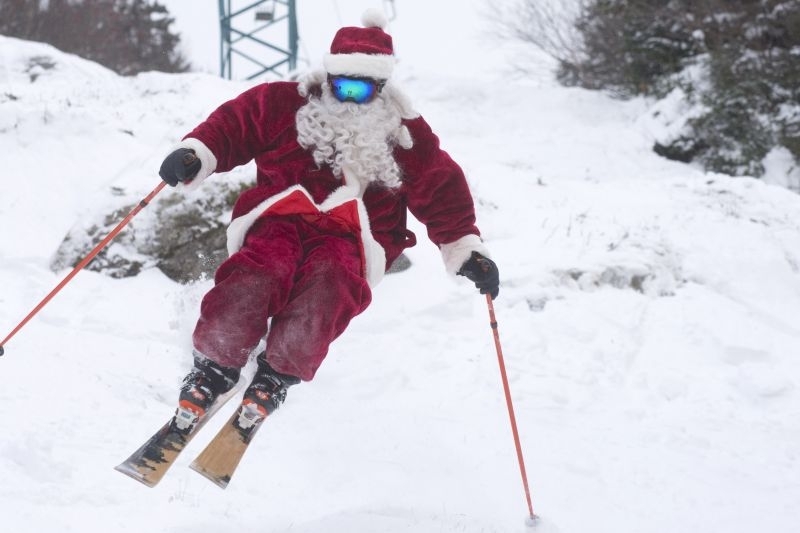 Plus, less time shopping means more time to ski and ride! The perfect adornment for any wall, from the ski chalet to the dorm room and everything in-between. 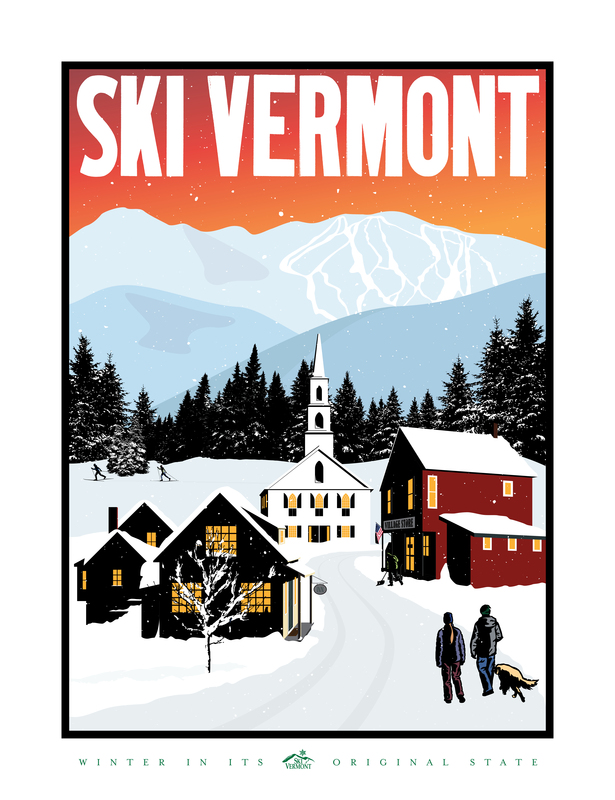 Choose from 15 full-color designs, suitable for framing, including this season’s brand-new Vermont ski village scene (below). Browse the full selection of available designs and order yours here. The Take 3 Beginner Package is the perfect gateway to Vermont’s official winter sports: For just $129, new skiers and snowboarders receive three professional beginner lessons at participating resorts, including equipment rentals and beginner lift tickets. The Fifth Grade Passport opens doors to exploring Vermont resorts. 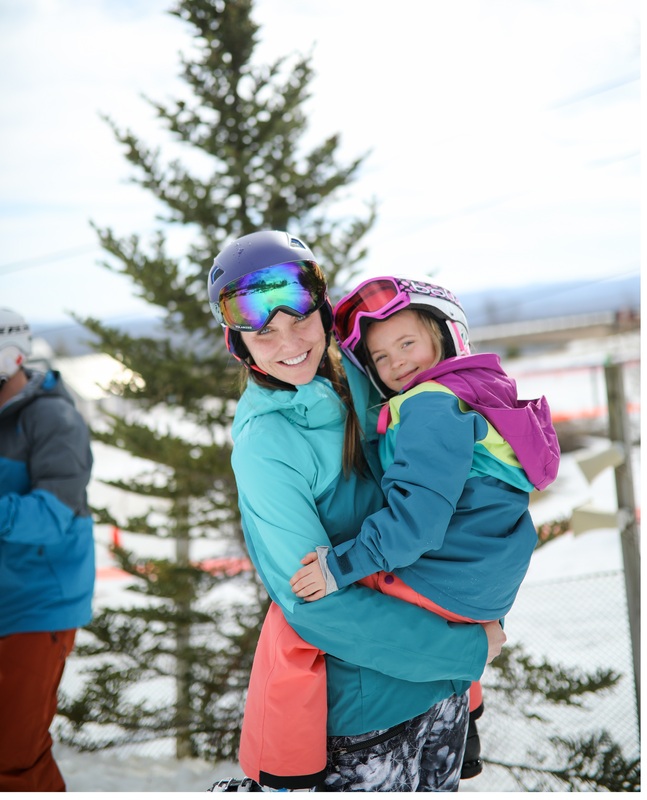 To help our youth get to the hills, we offer fifth graders enrolled in the program up to 88 days of skiing and riding at participating Vermont alpine and cross country resorts for just a $10 processing fee. January is Learn to Ski and Snowboard Month nationwide, and there is no better place to experience the thrill of learning to ski or ride than in its original state. 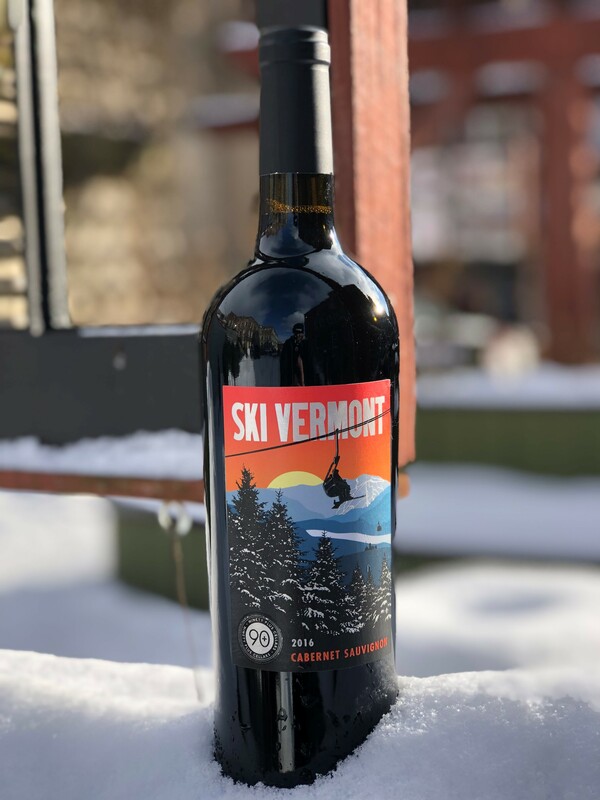 Ski Vermont is once again offering a $49 package for beginners including a beginner area lift ticket, professional lesson and rental in January 2019. Some restrictions apply. Visit Ski Vermont online for full details on its programs. The Powder Pass - Give the gift of fresh turns, and snowy smiles this holiday season. The Powder Pass is loaded with 5 anytime, any-day, all access lift tickets to Bolton Valley for less than the price of 3. Not sure if your loved ones will ski enough to purchase a season pass? The Powder Pass is your answer. Have some friends coming to visit? No problem. Just redeem a few of those tickets at once and treat them to an authentic alpine experience on the slopes of Bolton. Powder Passes are only available through Dec 9, so pick one up here. Sun Mountain Card - The Sun Mountain Card is our season long savings card that saves you up to $30 off lift tickets each day. Plus, it comes with one non-holiday lift ticket, making it virtually pay for itself! Purchase your card before December 14, 2018 for just $81. After December 14, 2018 the price increases to $91 through the end of the season. Cards non transferable. For more details click here. KidsRule 6-Pack & Pass - The KidsRule Mountain Camps, for kids ages 5-12, is our premier all-day program for skiers and snowboarders of all ability levels. Get six KidsRule lessons and a Full Junior Season Pass for just $975! A 2018/19 Junior Full Season Pass is $750. An all-day Kidsrule Mountain Camps lesson is $180, so six lessons at retail is $180 x 6 = $1080. You’re getting $1830 worth of product for $975, you smart one, you, plus your child is out on the slopes, learning AND having the time of their life. Win. For more details click here. Go from zero to hero with Killington Resort’s learn to ski/ride program. Participants are grouped by like skills and ambition when possible, and there’s no substitute for an experienced guide to get you started. Even the most seasoned professional athletes have coaches. Lesson packages for first-timers include the lesson, rental equipment and a limited learning area lift ticket and offer the best value. Start your journey toward ski and snowboard mastery here. Can’t buy the skier in your life the ski area he or she deserves? Go for the next best thing - a share in America's only skier-owned mountain, Mad River Glen. Imagine the look on their face when that present gets unwrapped and they realize that that are officially a "Ski Mogul.” More info here. The Magic Throwback Card gets you $29 tickets all season long with no blackout dates! The Throwback Card is only $149 – purchase now for ticket prices that will throw you back to the 1980s! The early bird gets the first chair - and the best deal on tickets at Pico Mountain - with My Pico 3 Packs, available now through Dec. 20. My Pico 3 Packs are available for advance purchase only and provide all ages with full mountain access to Pico Mountain for three days during the 2018-19 winter season. Store up on My Pico 3 Pack days to be used throughout the season or share them with friends and family and hit the slopes together. Triple your pleasure with the purchase of a My Pico 3 Pack here. 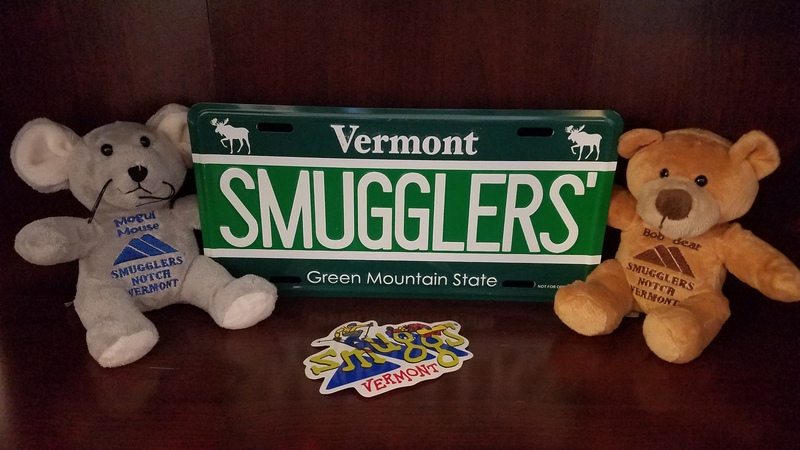 Smugglers’ Notch Resort is unrolling an online store to better-fulfill shoppers’ needs for popular items such as stuffed animals, glasses, apparel, gift cards, equipment and more! The idea for an online store was conceived after numerous frantic calls were received from parents dealing with misplaced treasures acquired on vacation to Smugglers’. Many family crises have been avoided by our staff finding and sending these popular items, in time for kids to climb into bed. The portal to purchasing pleasure can be found here. Ever wanted to have dinner on the slopes? 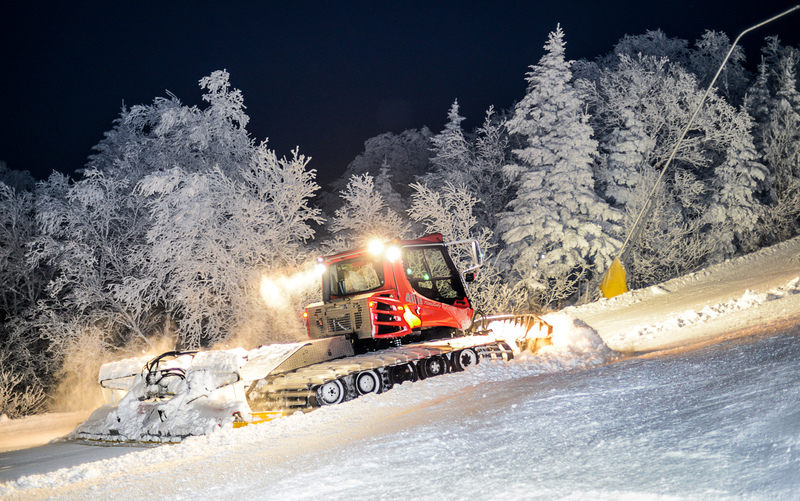 Take one of Stratton Mountain Resort’s SnowCats to the mid-mountain lodge for a fine dining experience. You’ll see the mountain through a whole new light and under the stars as you journey to 2,575 feet. The four-course meal features local Vermont fare and seasonal flavors like rabbit roulade with parsnip au gratin and golden beet sorbet, a culinary journey of its own. The cost is $156 per person and each dinner is capped at 20 participations, offering an intimate dinner setting. Reservations can be made online here. SugarDirect is available for purchase through December 20, 2018. 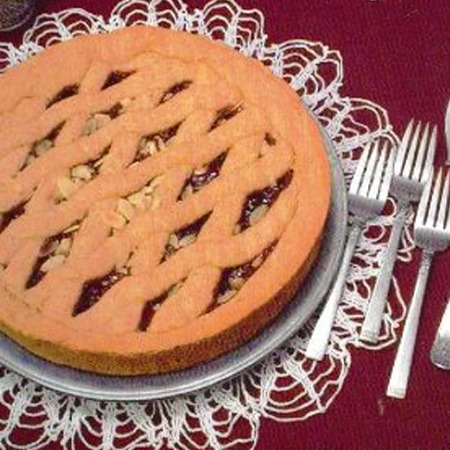 Everyone who visits Trapp Family Lodge wishes they could bring its charm home with them – and now you can, at least as far as dessert goes: An absolutely irresistible Austrian Linzertorte fresh from the Trapp Family Lodge Bakery. Shipped only in the contiguous United States. Available here. Looking for the perfect beverage to pair with your Linzertorte? There are plenty of excellent choices offered by the von Trapp Brewery. Visit the brewery’s website here. Everyone loves the warm knits and cool designs of the hats, neckwear and other products from Vermont-based Skida … You’ll be the most popular gift-giver this side of Santa thanks to delicious cheese from Cabot … Want to see some eyes really light up on Christmas morning? Put a snowboard from Burton or skis from Rossignol under the tree … Give the gift that keeps on giving, forever – Darn Tough socks, guaranteed for life … Even the most difficult-to-shop-for person on your list probably has a favorite flavor of Ben & Jerry’s ice cream … Sweaters are always the perfect gift during the winter months – and Dale of Norway has you covered with style and quality … Nothing gets adults into the holiday spirit better than – you guessed it – spirits from Mad River Distillers, Silo Distillery and Barr Hill … Finished your holiday shopping? Time to reward yourself with a tasty beverage from Long Trail Brewing Co. or Woodchuck Hard Cider!